Clearance and maintenance treatment is key to the management of this distressing form of psoriasis, says Dr Anthony Bewley. Psoriasis affects approximately 1.2 million people in the UK, the majority of whom will have or have had scalp psoriasis. Scalp psoriasis is notoriously problematic. Scalp psoriasis is very common, and even limited disease is responsible for marked physical and psychological consequences. The term pityriasis amiantacea, sometimes used by dermatologists, describes severe scalp dermatitis that leads to thick keratin scales that glue clumps of hair together. Pityriasis amiantacea is not specific to psoriasis, other causes include seborrhoeic dermatitis and eczema. The most common presenting symptoms of scalp psoriasis are included in the box below. Patients complain most bitterly of scaling, soreness, itchiness and hair loss. Scaling can be particularly unpleasant, as patients are aware of ‘severe dandruff'. Scaling Can be minor ‘dandruff', or large scales. Unsolicited, usually negative, comments from the public about patients' dandruff is frequently reported, and is one of the main triggers for patients' lowered self-esteem. It may seem trite for patients to complain that they are unable to style or colour their hair because of their scalp disease, but these processes are an integral part of self-expression and identity. Doctors and health care professionals should not underestimate the importance of being able to fashion hair. There are vast markets for hair styling products, and there are similarly vast non-medical markets for the treatment of scalp disorders. Even very mild, temporary hair thinning may be immensely deleterious to the patient's self-image. The diagnosis of scalp psoriasis is clinical. Examination of the scalp will show beefy red erythematous plaques often extending to just beyond the hair line. There may be variable scaling of the scalp, ranging from limited fine ‘dandruff' to the thickened keratin clumps of pityriasis amiantacea. Excoriations are common. Some patients will have hair loss, although this is unusual, and most commonly treatable and temporary. It is always important to examine other areas of the skin. Typical erythematous plaques and nail changes may be characteristic of psoriasis. Psoriasis is very unlikely to cause scarring. If scarring is seen (and sometimes determining whether hair loss is scarring or non-scarring is difficult even for experienced dermatologists), the differential of a scarring alopecia should be considered (see box below). Hair loss following scalp psoriasis is uncommon, but there may be temporary, mild, non-scarring diffuse alopecia. Contact dermatitis Usually acute (eg after hair dye). Can be severe. Lichen plano-pilaris: Lichen planus of the scalp. Clumpy hair loss. Violaceous follicular base with small spicules of keratin. May overlap with psoriasis (so-called sebo-psoriasis). Look dermatitis at flexures (axillae and groin). Scaly red itchy areas may indicate seborrhoeic dermatitis. Treatment of scalp psoriasis is often fairly difficult, but only because it is often messy and requires an investment of time and energy. The aim of treatment is to clear the scalp psoriasis and then to maintain clearance of the condition. All the usual rules of best practice doctor-patient communication apply. It is important to listen to patients carefully; to empower patients with their own decision making as much as possible; to educate patients so that they can control their own treatments and to advise patients about self-help patient advocate groups. It is very likely that patients will chose a treatment that best suits their lifestyle. The healthcare professional may advise messy but effective treatments, but if the patient is unhappy about the implications of that treatment, the professional must recognise individual choice. Xamiol is a topical combination preparation, which will facilitate patient adherence. It acts swiftly and is comparatively non-messy. The gel is applied to the affected scalp and then left on overnight. The following morning shampoo is applied to unwashed hair and then rinsed off after 10-15min. Apply on to the scalp at night (e.g. Cocois). The patient should part the hair systematically throughout the scalp surface area, applying the ointment to the scalp skin. This treatment is messy and may stain pillows. Advise patients to use old pillow covers. The preparation may also stain bleached hair, which can develop a green tinge. Warning patients with coloured hair is essential. Wash the scalp thoroughly the following morning using a tar and/or salicylic acid based shampoo the following day. Usually aqueous based preparations are less likely to sting (careful use is important to prevent side-effects and rebound psoriasis). Patients should use this in the morning after shampooing. The treatments should be repeated daily until the psoriasis is clear (this may take up to four weeks, but if the patient is motivated and meticulous, the scalp should clear). Maintenance of clearance is then with treatments in the box below. Patients, once they have control of their scalp disease, will be happy to use a mix and match of treatments to keep their scalp disease controlled. Second- and third-line agents that are prescribed for generalised psoriasis, will usually treat scalp disease. There are comb-like attachments for some phototherapy units, which allow the patient to comb through the scalp and apply a dose of UVB or UVA to the scalp skin. As above (careful, intermittent use). These may be used frequently (e.g. Capasal Shampoo and Polytar Shampoo). Some patients prefer to use these preparations intermittently with their usual shampoo. It may be necessary to use small judicious amounts of topical steroid at the hairline (eg to psoriasis which extends behind the ears). There is rarely any need to use a steroid stronger than a moderately potent topical steroid. 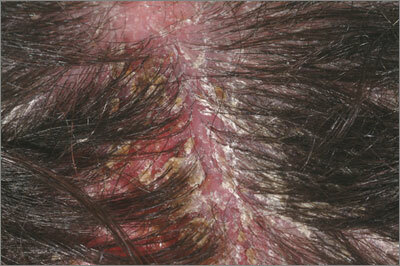 Scalp psoriasis can cause an inordinate degree of physical and psychological morbidity. Patients with scalp psoriasis may obtain clearance of their scalp disease with careful treatment. Once clearance is achieved, maintenance of clearance is easier.